Spectrum Wine Auctions offers real time online bidding from the comfort of your home or anywhere in the world you happen to be. The software will allow you to view and hear the auctioneer as well as bid in real time as the auction takes place. Your online bids are placed on the floor as if you were actually attending the auction in person. If you have already installed the software you can click on any of the auctions below that have live bidding enabled. Please Note: Audio and video are not available for Online-Only auctions. These features are only used in our Live auctions. 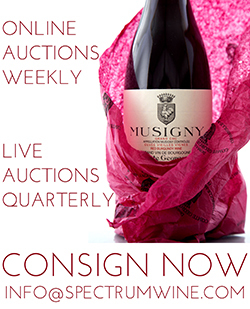 There currently are no auctions that have live online bidding available. 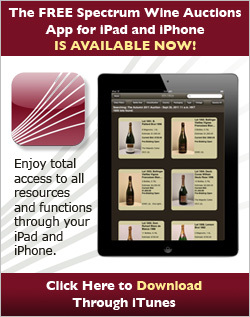 Click here to view auctions that are available for Pre-Bidding. Auctions are availble for Live Online Bidding one hour before the auction starts. If at anytime during the installation process you require technical support please contact our support team at (888) 982-1982 or +1 (949) 748-4845. Bookmark this page or save to your favorites so you can return easily once the live auction begins. Please review the computer requirements below and verify your computer will support the required software. About an hour before each auction starts the aution will appear in the list above and in the top of the webiste. Simply click on the "Start Live Online Bidding For This Auction" above to start the Live Online Bidding software. Adobe Flash Player 10 or above. Download Adobe Flash Player Here.